Mechanicsburg – Lance Dewease scored big on Friday night at Williams Grove Speedway, taking the 25-lap 410 sprint car main in his first appearance of the year at the track to boost his career win total there to 86 which is just four wins shy of the all time win mark at the historic oval. 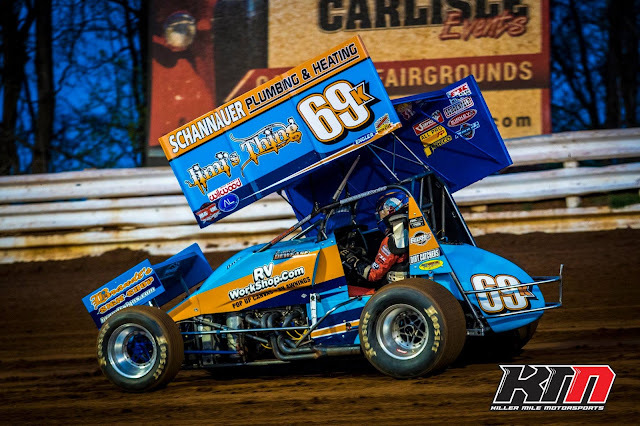 In the 358 sprint main it was Adrian Shaffer taking the season opener for the division at the track which turned out to be his fourth victory in a row in the Williams Grove lidlifter for the 358s. Danny Dietrich drew the pole to start the 410 sprint car main and after a strong showing in his heat, Dietrich may have been poised to run off with the victory but Dewease had other thoughts. After starting fourth in the field, Dewease streaked around the cars of Steve Buckwalter and Alan Krimes in the first corner of the opening lap to be along side Dietrich for control in the second corner. Dietrich tried to hold Dewease back and pulled ahead for a lap or so but to no avail as the Fayetteville flyer drove through the middle of the turns to net control on the third circuit. After getting control, Dewease pulled away from Dietrich and was just entering the backmarkers on the ninth tour when the races first caution flag unfurled. Dewease got away again on the restart and was again poised to enter traffic with eight laps to go when TJ Stutts brought out the red flag after a tumble on the backstretch. Dietrich could do nothing with Dewease at the new green as he again jetted away, this time to the victory that he took by 2.457 seconds at the finish. With his eyes set on the top prize of becoming the all time Williams Grove Speedway winner, Dewease said in victory lane that his next try at a Williams Grove win will be in two weeks when the All Stars invade for the running of the Tommy Hinnershitz Classic. Following Dietrich across the line at the finish was a very competitive Freddie Rahmer, Alan Krimes and Steve Buckwalter. Heats for the 36 cars in action went to Krimes, Rahmer, Dietrich and Esh with the consolation going to Matt Campbell. Shaffer wired the field for the win in the 358 sprint car main to open the class’ season at the track. Matt Findley trailed Shaffer for the entire distance but was never able to challenge. Eric Parker moved from 10th starting spot to finish third followed by Brie Hershey and Doug Hammaker. Sixth through 10th went to Jared Esh, Kevin Nouse, Jordan Givler, Chris Frank and Nyle Berkes. Heats went to Troy Wagaman Jr. and Doug Hammaker.